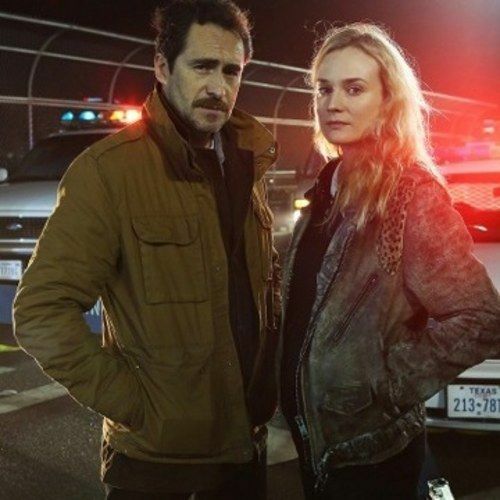 FX is headed for the border, placing a 13-episode order for The Bridge, a new drama series from Writer/Producers Meredith Stiehm and Elwood Reid starring Academy Award Nominee Demián Bichir and Diane Kruger, it was announced today by John Landgraf, President and General Manager, FX Networks. Production begins in April and the series premieres in July. The Bridge is a co-production of Shine America and FX Productions. The Bridge co-stars are Ted Levine, Annabeth Gish, and Thomas M. Wright, and Matthew Lillard guest stars. Gerardo Naranjo (Miss Bala) directed the pilot episode. Executive Producers of The Bridge are Shine America's Carolyn Bernstein and Filmlance's Lars Blomgren. It will be distributed by Shine International. Here's what FX president John Landgraf had to say in regard to the new series. "For years networks having been trying develop a drama series set on the U.S.-Mexican border without any success. I'm thrilled to say that Meredith Stiehm and Elwood Reid have become the first to crack that creative code and they have done so magnificently. There have been great films set in that world - No Country for Old Men and Lone Star come to mind - but never a great TV series. This one is special. The setting, the writing, the direction, and the way it is brought to life by Demián Bichir, Diane Kruger and the rest of the cast makes for truly riveting drama." Creators Meredith Stiehm and Elwood Reid also released a joint statement. "Working with FX has been amazing. The border has so many rich and compelling stories to tell and John Landgraf, Nick Grad and Eric Schrier, along with the Shine America team, are just as excited as we are to bring those stories to life." Shine America CEO Rich Ross also spoke about the new series. "We are thrilled to partner with FX on The Bridge, a series with tremendous auspices and a very strong international pedigree. As our first scripted series launch under the new Shine America banner, we could not be more proud of the team that has been assembled by Meredith, Elwood and Carolyn." In The Bridge, Demián Bichir stars in the role of "Marco Ruiz," a homicide investigator for the state of Chihuahua, Mexico living in Ciudad Juárez. A family man, Marco is one of the last good men in a corrupt and apathetic police force that is outgunned by the powerful drug cartels. He's sharp, charming, and observant and painfully aware that his city is in a state of chaos. When a body is dumped on the bridge that spans the El Paso-Ciudad Juárez border, Ruiz is forced to work with his American counterpart, "Detective Sonya Cross." Diane Kruger stars as "Detective Sonya Cross," a dogged cop who has an undiagnosed disorder that falls on the autism spectrum. Cross is shockingly candid and calls the world as she sees it, which can be off-putting to her colleagues, but she is also extremely effective at her job. Ted Levine plays "Lieutenant Hank Wade," a member of Detective Cross's team at the El Paso Police Department who is a veteran cop with a weathered, cowboy swagger. He is not surprised by anything that human beings will do to one another, but he's utterly baffled by the office coffeemaker. Hank knows that Sonya communication skills are challenged, and repeatedly has to advise her how to work more diplomatically with others. Annabeth Gish plays "Charlotte Millwright," a wealthy ranch wife suddenly widowed when her older husband Karl suffers a massive heart attack while on the Mexican side of the border. A sheltered woman with a ranch to run, Charlotte quickly learns that her late husband has many shocking secrets. Thomas M. Wright plays "Steven Linder," a wolf of a man who is no stranger to the dark and jumbled chaos of Juárez. Matthew Lillard plays "Daniel Frye," a cocky reporter with the El Paso Times whose hard partying ways have taken a toll on his once promising journalism career. FX originally ordered the Pilot episode in July of 2012, and wrapped Pilot production in December. The Bridge continues FX's push to increase its slate of drama series, bringing the number of dramas to four, to go along with one miniseries, six comedy series and two late night series. The Bridge is the 14th drama series ordered by the network which dates back to the launch of the network's groundbreaking Emmy and Golden Globe award winning drama The Shield (2002).